The Chargers were in the playoff hunt all the way into Week 17 in 2017, something that seemed near impossible after they started 0-4 and were 3-6 coming out of Week 10. LB Denzel Perryman struggled to get and stay on the field, as did first-round draft pick WR Mike Williams. As has been the story for many years for this franchise, the offensive line struggled, and while G Dan Feeney is young and inexperienced enough to still hope for continued growth, only T Russell Okung played well enough to not warrant a second look this offseason. This issue was not helped when second-round pick Forrest Lamp was lost to an ACL injury before the season started. There were plenty of positives for the Chargers, however, as WR Keenan Allen finally had a healthy season and launched his name into the upper echelon of receivers, Gus Bradley’s defensive scheme unlocked the potential of a deep secondary, and the continued emergence of Joey Bosa paired with Melvin Ingram gave the Bolts the best pass-rushing duo in the NFL. With players like Lamp, Perryman, and Jason Verrett looking forward to a hopefully healthy 2018, a couple improvements to the offensive line and interior of the defense would make both units strong enough to launch the Chargers into serious contention. Antonio Gates is a legend for the team, but he’s not the most important free agent the Chargers have when you exclude sentimentality. No player truly rates as a “must re-sign,” but Boston heads the list of candidates the Chargers should try to get back into the fold if they can. He played the most snaps of any defensive player for the Bolts this year and was their primary deep safety, as he lined up as a free safety over 900 times on the season. He was more than reliable in coverage, ranking ninth among safeties with an 87.8 coverage grade, but he was also 42nd among safeties in tackle efficiency in the running game, and run defense was an issue that plagued the Chargers this year. So even in Boston’s case, the team might be ready to look elsewhere next year, especially if they believe they can reshuffle the starting lineup to include both Jaheel Addae and Rayshawn Jenkins, that latter of whom they drafted last year. 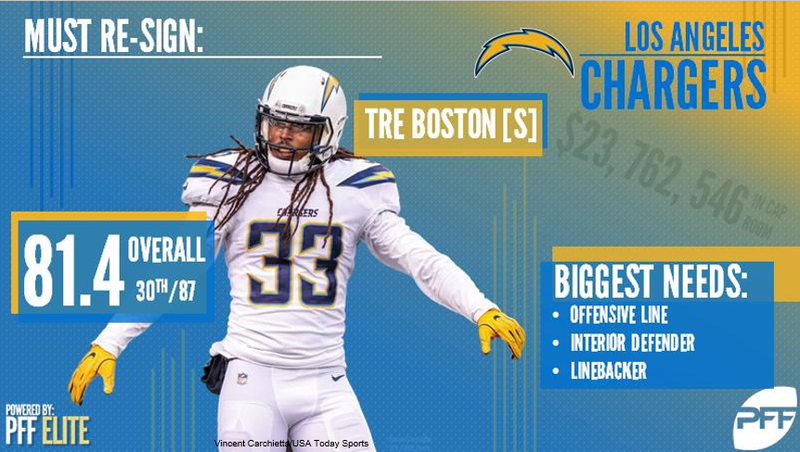 If Jenkins isn’t ready for more playing time, and the Chargers aren’t willing to bring back a solid player in Boston, they should bat for the fences and bring in the highest-graded safety in the free agent class. Joyner posted a coverage grade (92.2) that tied Harrison Smith for the best among safeties and a run-defense grade (80.7) that was markedly better than Boston’s 43.4 grade. The Chargers spent the season looking for real solutions at linebacker with Perryman on the shelf for most of the campaign. It showed in their run defense primarily, but they also never found a quality running mate for Perryman in nickel defense. Hayes Pullard struggled, Jatavis Brown‘s play took a step back in the new scheme, and the Chargers appeared uninterested in what Korey Toomer was bringing to the table. Nigel Bradham isn’t a name that jumps off of the roster for the world champion Philadelphia Eagles, but he should be well known for his coverage abilities from the linebacker spot. He posted the sixth-best coverage grade among linebackers this year on 700 snaps. When you’re chasing a team like Kansas City, with over-the-middle options like Kareem Hunt and Travis Kelce, a player like Bradham is extremely valuable. With Dan Feeney and Forrest Lamp looking set to be 2018 starters, the interior of the offensive line could use both an upgrade and veteran leadership. While the Chargers could pursue a guard and move Feeney to center, the simplest answer would be landing a center like Sullivan or Ryan Jensen. Sullivan is the older of the two players, but he also had a higher run-blocking grade last year and did so in a rushing offense with more in common with the Chargers than Jensen, according to the PFF Rushing Report. Sullivan also has 5,000-plus snaps more than Jensen, and all that experience would come in handy with a pair of very young guards on either side of center, so the Chargers might be better off with Sullivan as a short-term replacement.